Which adults should get vaccinated against rubella (also called German measles)? Adults born in 1957 or later who have not been vaccinated or have not had rubella. Non-pregnant women of childbearing age no matter what year they were born. College students, teachers, healthcare personnel, and international travelers are at increased risk for rubella. Rubella is part of a combination vaccine called MMR that also protects against measles and mumps. if a pregnant woman gets rubella, there is about a one-in-five chance of damage to the fetus, like deafness, mental retardation, or liver, heart, or spleen damage? What happens when someone gets rubella? Symptoms of rubella include rash, slight fever, aching joints, and reddened eyes. The rash first appears on the face, but then will continue to spread over the entire body. The lymph nodes behind the ears and the back of the neck may swell, causing soreness and pain. Why is rubella vaccine important? If a pregnant woman gets rubella during pregnancy, her baby is at risk of serious birth defects including heart defects, mental retardation, liver and spleen damage, and deafness. There is a 20 percent chance of damage to the fetus if a woman is infected with rubella early in pregnancy. FAQ: How do you get rubella? 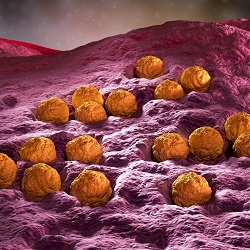 Rubella is a virus that is spread when an infected person coughs or sneezes.